Klara originally was born back in 2013. It was part of my advent calendar back then and it was published bit by bit. However I never was completely satisfied with her eyes and at some point back then I just lost interest in her. This eyes made me crazy. 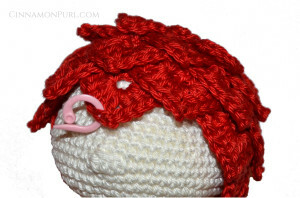 The pattern was available for nearly two years – still without eyes. These were only published on the blog, but never made it into the pdf. So I decided to take the pattern down, until I would finally make new pictures, with eyes on the doll. And what can I tell you? Life! It just stopped me, I’m so sure that all of you know this. You plan to do something and then you just forget about it. Over and over again. (I’ve recently read a nice text about this: you know when you enter a room and you wanted to do something and then you just forget about it? at that same moment there were aliens in the room with you, and then the Men in Black appeared, fought off the alien, then they neuralyzed you. That’s how you forgot..) Just a little site note, but I found it funny. 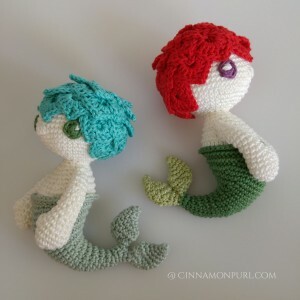 Klara is worked in classic amigurumi style, which means in a long spiral round, never join a round after finishing one. Also I like my amigurumi to be worked through both loops (whereas I know couple fellow amigurumi makers who prefer the back loop only). So do whatever you like best. 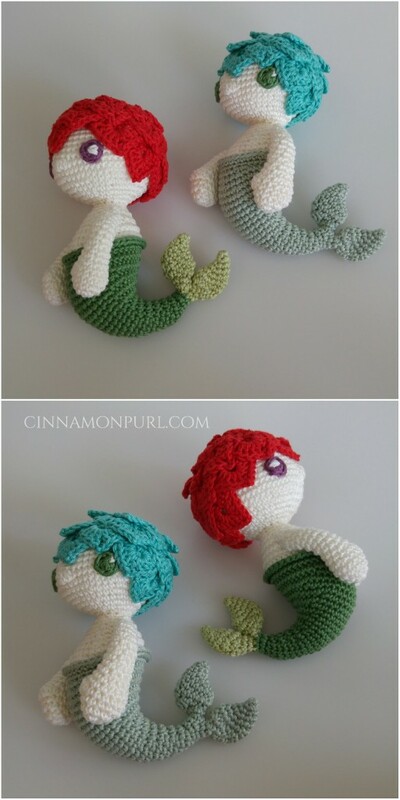 So, your little mermaid will be the size you choose, go with bigger yarn and a bigger hook and you will get a bigger mermaid. 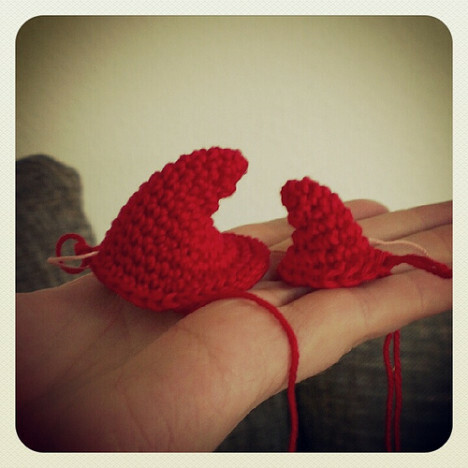 If you decide to go smaller, of course your Klara will be smaller, as easy as this right? Don’t cut the yarn on the second fin. Now it’s time to crochet both parts together and start on the tail itself. 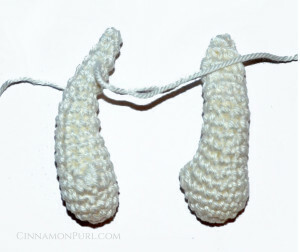 11 – – sc3, put the loop of first fin onto hook as well, sc2tog, sc4 – now continue to crochet on former second fin with sc2 – only use the last two sts before the marker, which means to leave 1 stitch of each fin untouched. Now add the new body color to the back loops of R39 where you started with the single chain stitch. See the arrow in the picture below. The dot marks the old marker, I use pieces of wastes yarn as markers. As you can see we are shifting the position of the marker from its the last position. Now start in the same stitch that you attached the new color to. In R40 we will work 37 sts – it may seem like you can squeeze in 38, but this extra space results from the ch1 & BO and we won’t use this extra stitch. hide the yarn end or leave it to help fix the hair in place. 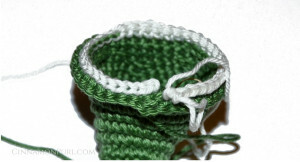 BO with a slst and cut yarn – leave long enough to start sewing the hair scales to the head. 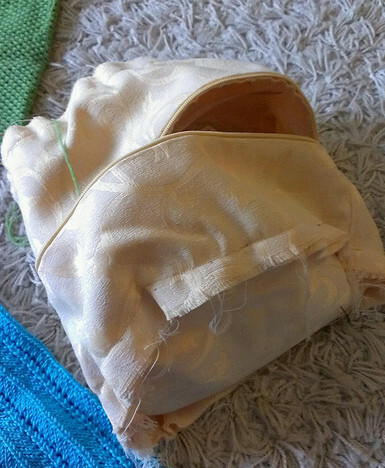 Sew arms to sides of body, take care to point the thumbs in the right direction. Thank you, I have been waiting for this release since I found your little mermaid. I’m so excited. Oh wow, this is simply incredible! 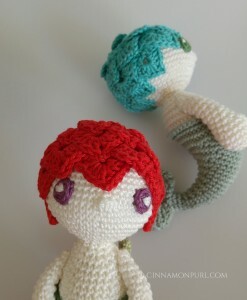 I’ve never seen an amigurumi doll with such shape and character. It’s incredibly generous of you to share the pattern for free. 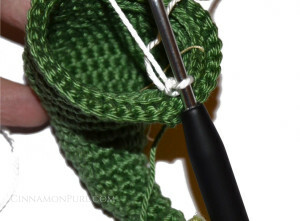 I have a question… When it comes to the slip stitches (I’m working on the tail right now), do you crochet through the loops they make or through the previous row that they are on top of. Thank you. Thank you so much!!! I too have been waiting for the re-release of this pattern since I found her on Ravelry 9 months ago . She is so cute!! And Thank you so much for sharing her for free that is very generous of you as this doll is so unique you could have easily made this a paid pattern! This pattee is great! May i just ask if i can sell the finished product made from this pattern? I am having a little trouble understanding what to do on row 11 for the tail. After I add the loop for the first gin on the crochet hook am I sc2tog, sc4 on both the fins or just the first fin? Do I use the long tai from the first fin or the working yarn from the 2nd fin to work these crochets? after adding the first fin back onto the hook and sc2tog you work the next stitches on the 1st fin only. This was you will be able to form a “tube” that will be the tail soon and will end in the two fins . 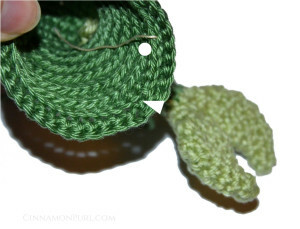 You don’t use the long tail, this can be stuffed into the tail later, continue using the working yarn. I try to always have as little sewing together in the end as possible. How exactly do you see the eyes to the head so you don’t see the stitches? 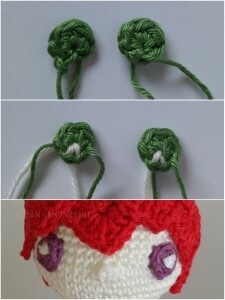 Hi Niki, I use the yarn end of the eyes, this way I use the same color and stitches won’t show so easily, then I go up an down always only crossing on crochet stitch. The stitches basically hide themselves when pulling a little on the yarn. I also sew into the outer stitches of the eyes and not across the actual boarder. Does this make sense? Ich love this pattern and tried to make a Klara for my little girl. She’s so cute and it was love at first sight. But I had a few problems with your pattern. So I translated it into German and counted the stitches in each raw. I found a small difference in numbers of stiches in raw 32 of the tail. Have a look at it. I might be wrong, so please have a look at it. I love your work. Thanks for sharing. this pattern is so clever! you used scales for the hair, thats genius! =D thanks for sharing! I am having major problems with the pattern. My mermaid seems to be coming out crooked, and a bit lumpy. I’m so confused. I would love to see a video tutorial for this mermaid, she’s so cute!!! I just finished Charlie the Seahorse. I tried Clara once, but failed miserably. I will not give up, I’m in live with her and have to have me for my own;) Thank you for the wonderful patterns!! !